In a rare interview, Marian Price has revealed the toll her time in isolation in Maghaberry prison has taken on her physical and mental health. A 57-year-old mother of two, Ms Price has been held without charge in isolation in the all-male jail since British Direct Ruler Owen Paterson ‘revoked her licence’ in May. Along with her sister, Dolours, she became a household name when she went on a lengthy hunger-strike and was force fed in Brixton prison. Gravely ill with tuberculosis and anorexia, and weighing only five stone, Price was released on licence in 1980. Weeks later, she was granted a royal pardon. Asked repeatedly in court to produce the pardon, the British government now says it has been shredded. 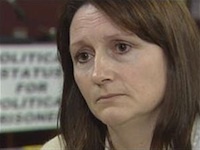 Ms Price appeared before the life sentence review commission in Maghaberry on Wednesday. Granted a visit last week, the Sunday World’s Suzanne Breen found the veteran activist alone in a large, soulless room in an isolated part of the jail. Her hands and arms are covered in psoriasis, brought on by stress. She’s shed several stones in weight and is losing her hair. “When I brush it every morning, it falls into the wash-hand basin in clumps,” she said. The DUP claim she’s enjoying a life of luxury in the County Antrim prison. “That’s ludicrous,” she said, describing in detail her existence in a small sparse cell and tiny exercise yard. The perimeter of her exercise yard measures just 85 paces and is surrounded by a 25-ft high wall. She speaks of the “mind-numbing boredom” of solitary. She’s allowed only two books a week. She reads Swedish crime writer Stieg Larsson’s novels and surprisingly the right-wing British Daily Mail “for the word puzzles”. She watches nature and current affairs’ documentaries on TV. Confounding the Irish republican stereotype, her favourite programmes are the English period dramas ‘Downton Abbey’ and ‘The House of Elliott’ - “I love the fashion, especially the hats and the coats with the embroidered sleeves!” she declares. With her sister Dolours and Gerry Kelly, now a senior Sinn Fein politician, Price was part of an IRA team which in 1973 carried out attacks in Britain. The sisters were arrested about to fly home from Heathrow. While on hunger-strike in Brixton jail, Price was force-fed 400 times over six months. That stopped when a doctor mistakenly put the tube into her lung and she lost consciousness and nearly died. Price is currently facing two charges relating to so-called ‘dissident’ activity - holding a speech for a Real IRA member at an Easter commemoration and allegedly providing a mobile phone. She was granted bail on both charges. “I’m not whinging about either charge. Let justice take its course,” she said. Price stressed that, unlike many Sinn Fein leaders, she’d never lie about her IRA past and was “very proud” of it. She’s even more uncompromising than her male comrades. When a Sinn Fein delegation, including Assembly members Jennifer McCann and Raymond McCartney, visited Maghaberry, the male prisoners met them. She accepted that her views currently have little electoral support. “but being a republican isn’t about entering a popularity contest - it never has been,” she said. As long as Britain remained in the North of Ireland, “Irish people have a right to resist that occupation”.